This biography of a living person needs additional citations for verification. The reason given is: Outdated and unreliable sources. Please help by adding reliable sources. Contentious material about living persons that is unsourced or poorly sourced must be removed immediately, especially if potentially libelous or harmful. Scott was born on July 19, 1961, in New York City, the son of American actor George C. Scott and Canadian-American actor Colleen Dewhurst. He graduated from John Jay High School with friend Stanley Tucci, , before he graduated from Lawrence University in 1983. His brother is Alexander Scott. [better source needed] He also has one paternal half-sister, actress Devon Scott. Scott's first role is in 1987 film Five Corners, as a policeman. In 1990, Scott played a lead role in the ground-breaking film Longtime Companion, which chronicles the early years of the AIDS/HIV epidemic and its impact upon a group of American friends. In the following year, he appears briefly in Kenneth Branagh-directed, Dead Again, and co-starred in the movie Dying Young (in which his mother also appeared) alongside Julia Roberts. He also appeared in the 1992 Cameron Crowe movie Singles alongside Bridget Fonda and Kyra Sedgwick, and in 1996, he teamed up with Stanley Tucci to direct the film Big Night. The film met with critical acclaim and was nominated for the "Grand Jury Prize" at the Sundance Film Festival. For their work, Scott and Tucci won both the New York Film Critics Circle Award and the Boston Society of Film Critics Award for Best New Director. In 2002, he was awarded the Best Actor prize from the National Board of Review for his notable performance in Roger Dodger. Scott starred in Six Degrees on ABC in 2006. In 2005-2006, Scott served as the reader for the audiobook versions of Stephen King's bestsellers The Shining and Cell. In 2007, Scott lent his voice for the narration of a Chevron Corporation television ad, as well as the critically acclaimed Iraq War documentary film, No End in Sight. He also appears in the romantic comedy Music and Lyrics, starring Hugh Grant and Drew Barrymore. Next up for Scott was the 2009 drama Handsome Harry. Scott also had a recurring role on the USA drama Royal Pains, as Boris Kuester von Jurgens-Ratenicz. On August 28, 2009, TVGuide.com confirmed Scott was cast for the third season of Damages. Scott was a series regular, playing Joe Tobin, the son of indicted Bernie Madoff-like Louis Tobin (Len Cariou). The season aired from January to April 2010. In May 2010, Scott provided the voice-over for a new Häagen-Dazs TV commercial called "Ode to Flavor". The ad was created by Goodby, Silverstein & Partners, directed by Noah Marshall with art direction by Croix Cagnon. He played the role of Richard Parker, the father of Peter Parker, in the 2012 film The Amazing Spider-Man. Scott reprised his role in the 2014 film The Amazing Spider-Man 2. From December 2015 to March 2016, Scott appeared as Lloyd Dallas in the Broadway revival of Noises Off. In 2017, he collaborated with Dutch DJ and producer Ferry Corsten on Blueprint, an album combining Trance music and science fiction, in which he can be heard as the story's narrator. 1986 L.A. Law Office Clayton Episode: "Sidney, the Dead-Nosed Reindeer"
1987 Family Ties Eric Matthews Episode: "Invasion of the Psychologist Snatchers"
2017 Last Week Tonight with John Oliver Segment: "Harding"
2017 Lore George Brown Episode: "They Made a Tonic"
2019 At Home with Amy Sedaris Yves St Au Jus Episode: "Creativity"
^ Kahn, Toby (January 22, 1996). "Touch of Evil". People. Archived from the original on September 28, 2013. Retrieved December 10, 2012. ^ a b "Campbell Scott Biography". Net Glimse. Archived from the original on April 8, 2009. Retrieved February 8, 2013. ^ Adam Bryant (August 28, 2009). 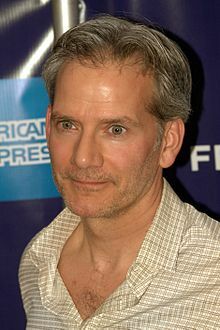 "Campbell Scott Joins Third Season of Damages". TVGuide.com. Retrieved August 28, 2009. ^ Cwelich, Lorraine. "Campbell Scott on Roberts, Rossellini, and How to Stay Fresh". Interview Magazine. Retrieved September 20, 2011. Wikimedia Commons has media related to Campbell Scott.